DOWNLOAD YOUR COPY OF “THE RULES” FOR YOUR OWN WEIGHT LOSS CHALLENGE.EASY TO USE FILL IN THE BLANK TEMPLATE. Why do you need rules? Workplace Challenges are fun so you need to be careful to not overstep the personal boundaries needed in the workplace. When running a challenge you should be sensitive to peoples privacy. This includes how to record starting and final weigh-in’s. Participation in a Weight Loss Challenge can be offered in an exciting way to entice participation without demanding it. Once you have determined how the Challenge will be scored the teams need to be divided fairly. Men, women, weight class etc. Other important rules to ensure fairness include selecting team leaders and judges. Fairness can also dictate what to do if someone drops out and be specific on what can disqualify a participant. If the Challenge included group fitness programs make sure they are accessible for all fitness levels. Prizes need to be great for whomever wins and not be size or gender specific. If you would like your copy of our fill-in-the-blank Challenge Rules that you can modify for your own Challenge just fill in your email and click “Download”. 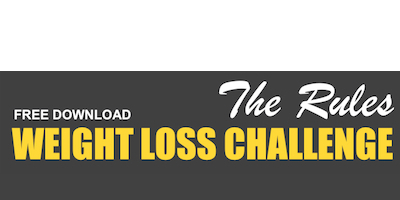 This is a 7 page PDF Weight Loss Challenge rules that can be used for work groups, friends, or family.